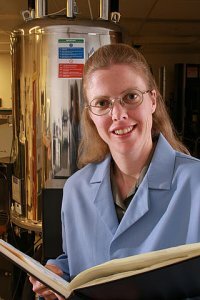 Congratulations to Dr. Wendy Shaw of Pacific Northwest National Laboratory on winning a prestigious Department of Energy Early Career Research Program grant. This grant funds Shaw to design effective, inexpensive catalysts that mimic some of the design principles found in natural enzymes. The grant bolsters the scientific workforce by supporting exceptional researchers during their early career years, when many scientists do their most formative work. Shaw, who graduated from the University of Washington in 2000, has experience in multiple disciplines including biology and chemistry. The grant will allow her to focus on catalysts that will ultimately enable the efficient use of renewable energy such as solar or wind, by mimicking natural enzymes that facilitate efficient transformation between fuels and energy. While today's catalysts rely on platinum which is rare and expensive, natural catalysts such as hydrogenase use nickel, iron, and other inexpensive, abundant metals. Shaw will build catalysts by developing and attaching small proteins, called peptides, to already fast nickel-based catalysts. These peptides will be specific to transporting protons to and from the active site for hydrogen production. By mimicking some of the proton transport features that enzymes use to achieve fast, efficient catalysis, the activity of these relatively simple catalysts can be enhanced to achieve similar rates to those found in nature. In conducting this research, Shaw will collaborate with others, including Dr. David Baker at the University of Washington. Other collaborators are from the Center for Molecular Electrocatalysis and the Institute for Integrated Catalysis. Also, Shaw will use computational resources at DOE's EMSL, a national scientific user facility at PNNL.